Pendent clusters of sweetly scented, primrose-yellow flowers on bare stems in March and April followed by bronzed hazel-like leaves, maturing to bright green. 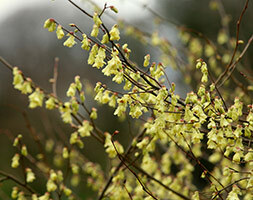 Winter hazel makes a wonderful specimen plant for a partially shady shrub border or woodland edge. Bushy and spreading in habit, to fully appreciate the delicate cowslip-like perfume it&apos;s best planted in a sheltered position close to an entrance or path.